MOSCOW, Russia -- President Vladimir Putin's public silence as pro-Russia militants have ceded key towns in recent days to government troops in Ukraine has raised questions about the depth of his support for the rebels. 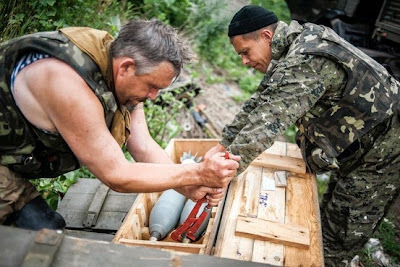 Ukrainian sappers neutralize shells Wednesday that were left behind by rebels who fled from Slavyansk. At the same time, the Kremlin is still allowing weapons and fighters to cross the border into Ukraine, rebels and officials in Kiev and the West say, and keeping up diplomatic pressure on Kiev to stop its offensive. By sending mixed signals, Putin is trying—again—to blunt any push in the West for stronger economic sanctions against Russia. "Putin will fly just under the radar, that's what he's been doing," says Dmitry Trenin of the Moscow Carnegie Center. The Kremlin also wants to shift the conflict from the battlefield, where Kiev appears to be gaining momentum and the costs of Russian intervention would be prohibitive, "to the political field and the economic field, where Russia has lots of levers to put pressure on Ukraine," said Mr. Trenin. For the moment, the effort to deflect sanctions seems to be working better than attempts to revive negotiations between Kiev and the separatists. The European Union agreed Wednesday to add 11 more names, mostly Ukrainian separatists, to its sanctions list, effective later this week. But diplomats said ideas for further ratcheting up the pressure were shelved at least until next week, when EU leaders meet. In Washington, U.S. officials said they, too, aren't ready to impose more sanctions at present. European diplomats say they see the Kremlin's apparent rhetorical softening in recent days as a sign their threats are having an effect. Privately, Russian officials also admit that the fear that wider sanctions—particularly those threatened by the U.S. on entire business sectors, like banking—would hammer the country's already-stalled economy has led them to push harder for a negotiated solution. Even the limited sanctions imposed so far—asset freezes and travel bans on dozens of politicians and others—have hurt the economy by undermining investor confidence, pushing capital flight to nearly $75 billion in the first half, more than in all of 2013. So far, the Kremlin has repeatedly dodged the threat of tougher measures with steps that appeared to reduce tensions but didn't actually take the heat off. Most recently, European leaders set a June 30 deadline for Moscow to push the separatists to give up key border crossings or face more sanctions, backing up the threat with personal calls to Mr. Putin. The Kremlin responded with its own offer of joint border patrols. That plan never took off, but the gesture was enough to deflect the drive for new sanctions. "Russia seems to be a master at escalating and de-escalating at the same time, acts of duplicity which keep the Western world off balance," said Sen. Bob Corker, (R., Tenn.), at a Senate Foreign Relations Committee hearing Wednesday. The focus on the conflict in the east also has another benefit for Moscow—taking the spotlight off its annexation of Crimea in March. The Kremlin has drawn up expensive plans to link the strategic peninsula to the Russian mainland, and still brooks no questioning of its new status. "If it is a question of attacks on Russian territory, and that's what Crimea and Sevastopol are, I wouldn't advise anyone to do that," Foreign Minister Sergei Lavrov warned. But the battlefield setbacks for the separatists do present a potentially sensitive domestic problem for the Kremlin. For months, it has stoked nationalistic emotions at home with heavy propaganda on state television. Putin has frequent pledged to protect the interests of compatriots even outside Russia's borders. Although "a prolonged military conflict isn't in Russia's interests," the Kremlin has to find a way to shift the conflict to the political track "without appearing to betray" the separatists, says Mr. Trenin of the Moscow Carnegie Center. In recent weeks, the Kremlin has seemed to be paving the way for a more pragmatic solution. Russia's state media have largely dropped the hard-line nationalists who had been on-air staples this year calling for an invasion and the restoration of Novorossiya (New Russia)—a Tsarist-era term for a region covering most of eastern and southern Ukraine. In their place are heavyweights pushing a more moderate line. In late June, former prime minister Yevgeny Primakov, still an informal adviser to the Kremlin on foreign policy, and who is known for his hard-line anti-West views, gave a long interview to Rossiya-24 state television in prime time, rejecting military action and calling for compromise. "I think we overdid it a bit in our coverage of the events," he said, in a rare public criticism. "The overall tone was as if we were preparing the country for war." Putin, too, has dialed back the public defiance a bit. In a Kremlin appearance on Wednesday, he said Russia would defend its national interests "persistently but cautiously and carefully." Thomas Graham, a Russia expert and former senior White House official under President George W. Bush, said, however, that the Kremlin's goal remains the same: "a government in Kiev that at a minimum is not hostile to Moscow and a Ukraine that is not moving with abandon toward Europe." Publicly, the Kremlin continues to advocate diplomacy, but without acceding to Kiev's demands that the separatists disarm first. "What Putin wants is to preserve some kind of appearance of a negotiated process," says Dimitri Simes, president of the Center for the National Interest think tank in Washington and a Russia specialist. A revival of talks would raise the pressure on Kiev to suspend its military operation again, giving the rebels a new lease on life while legitimizing their leaders as a political force. But the Kremlin's efforts in late June to push the separatists to join Kiev's unilateral cease-fire failed, as the fractious fighters didn't follow through on their pledges. In a call with his French and German counterparts on Wednesday, Ukrainian President Petro Poroshenko said his government had offered a variety of options for restarting talks but the rebels refused, his office said. Moscow's efforts to turn the separatist leaders into a credible political force in Ukraine are also handicapped by the fact that many of them are Russian citizens with few ties to the region. Even separatist leaders admit there are few locals with broad appeal. "We have a terrible shortage of cadres," says Donetsk separatist leader Denis Pushilin.